Japanese automaker Suzuki Motor Corp's two joint ventures in China are expected to soon be combined into a single entity after a milestone merger between its Chinese partners. A top executive from State-owned Chang'an Motor Corp, China's third-biggest auto group, said "we are studying" the amalgamation between Chang'an Suzuki and Changhe Automobile Co Ltd. "We will make it soon." 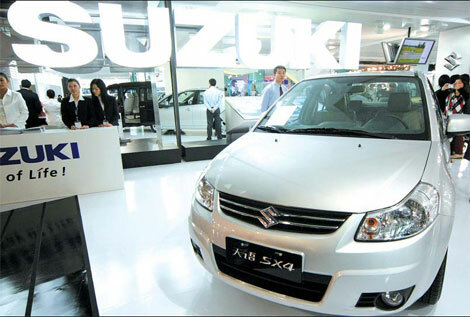 Chang'an Suzuki operates in Chongqing municipality in the nation' southwest, while Changhe Suzuki has its production facilities in East China's Jiangxi province. In November, Chang'an signed an agreement with Aviation Industry Corp of China (AVIC), a State-owned aircraft maker, to take over its main auto assets including Changhe, the joint venture Changhe Suzuki and others. In return, AVIC received a 23 percent stake in the enlarged Chang'an from the carmaker's parent China Weaponry Equipment. The deal represented the biggest merger in China's auto industry. In preparation for merger of the two joint ventures, Chang'an reshuffled the top management at Changhe. In January, Zou Wenchao, former vice-president of Chang'an and executive vice-president of the group's joint venture with Ford Motor Co, was named chairman of Changhe. Li Li, also former vice-president of Chang'an, was designated general manager of Changhe. A top official from Suzuki China recently announced that the Japanese automaker supports the merger of Chang'an Suzuki and Changhe Suzuki. The Japanese company expects to combine sales networks as the first step. Chang'an Suzuki, formed in 1993 with a registered capital of $190 million, produces Suzuki's SX4, Swift and Alto micro and subcompact cars. It now has an annual production capacity of 200,000 vehicles and 200,000 engines. It has more than 3,000 employees. 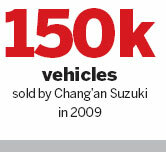 Sales by the joint venture rose by 21 percent last year to 150,069 vehicles. It aims to move 180,000 units this year, according to data from market research firm JD Power. Changhe Suzuki was established in 1995 with a registered capital of $251.8 million. It has the capacity to manufacture 200,000 micro buses and cars as well as 150,000 engines. It has almost 2,000 employees. Its sales grew by 26 percent to 89,968 units last year.